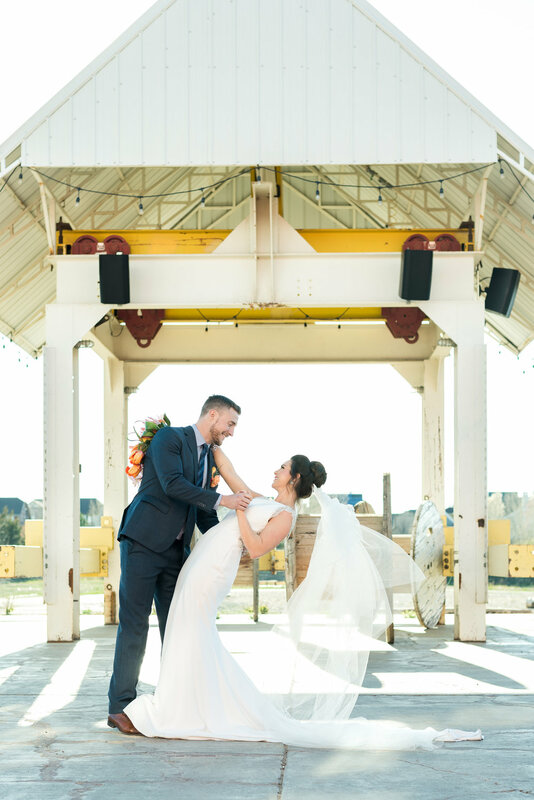 Kimberly Rose embodies the idea that we spend special events with the people we care about, and our goal is to capture those moments and feelings with design, originality, and a little magic. January: that inevitable time of year where I start itching for Spring and Summer and wedding season! So, I thought this would be the perfect time to showcase a styled shoot from last winter that is just dripping with bright colors and sunshine! Fabulous photographer and friend, Nina De Zayas, with From the Hip Photo and I collaborated on three different shoots last year (can you tell we love doing them??). Shoots are the perfect cure for the off-season blues! 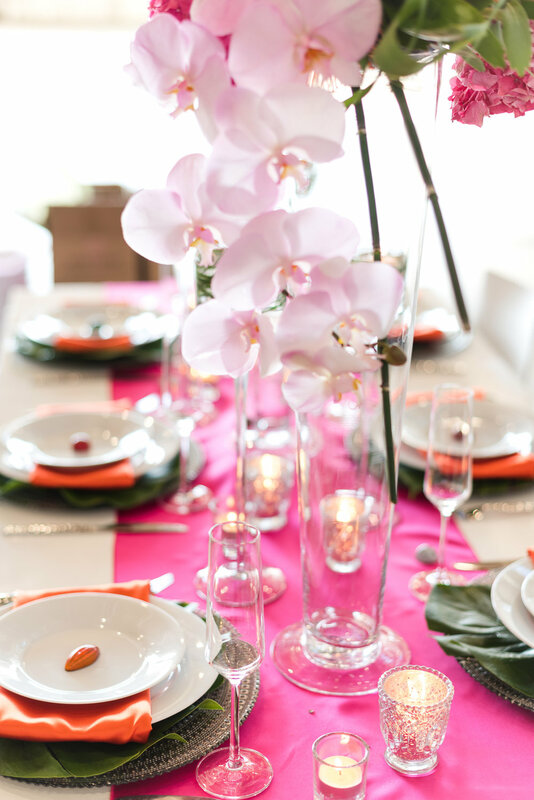 For this shoot, Nina asked me to create a colorful and modern wedding wonderland. The shoot took place in a newer venue in Denver called The Hangar at Stanley, which is a converted airplane hangar. I wanted to mirror some of the industrial elements of the venue with clean lines and sharp angles, while also creating a juxtaposition with soft draping and delicate florals. We enlisted a team of some of the best wedding vendors, and the result was magical. 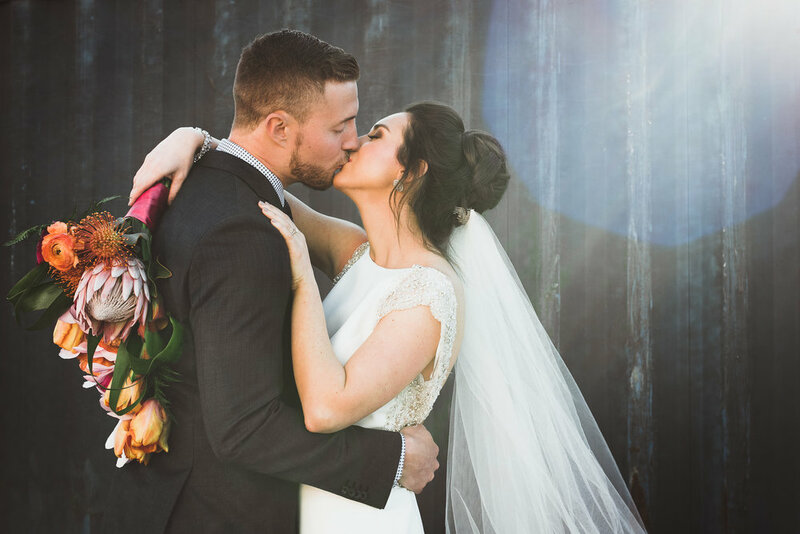 Our beautiful real-life couple, Danielle and Michael, stole the show with her gorgeous dress from The Bridal Collection and a jaw-dropping bouquet. Lighting and Design by Scott created soft white draping which we offset with snazzy red chairs and tons of candles for a lush lounge vignette. One of the more unique pieces in this shoot was the chandelier bar we used to showcase the very modern cake and cookies by Cakeheads. Nina had fun staging our couple on and around the bar, to create on of Kimberly Rose Events top nine most liked Instagram photos of 2017!! 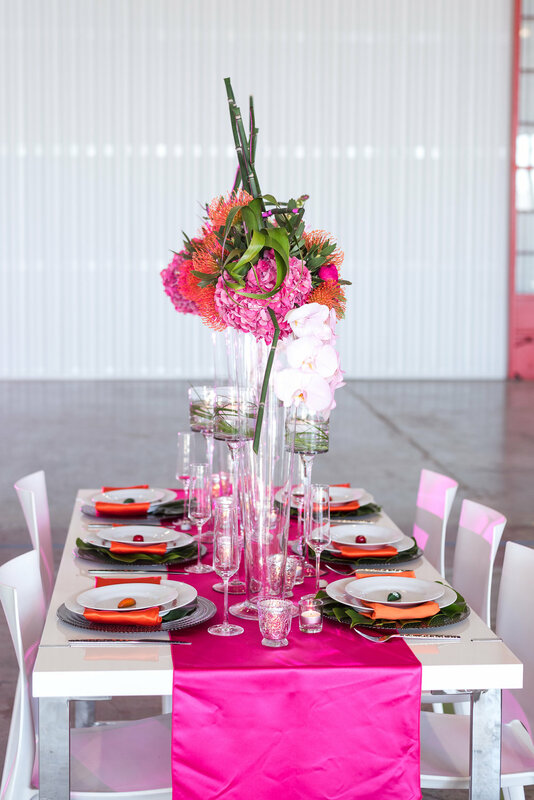 I hope this shoot filled with laughter, color and magic inspires brides to think outside the box and put a little pizzaz into their wedding decor.